This coming week holds several important days – both secular and spiritual. Monday evening marks the beginning of Passover, one of the holiest times in the Jewish calendar. Also known as “Pesach”, it refers to passing over or sparing someone. In this case, it refers to the spared children of Israel while under the rule of the Egyptians during a time of plague. It was after this that the Jewish tribes were chased from the land. The first night of the 8 day holiday is celebrated with a Seder meal with family and friends. This meal offers only certain food and follows a specific order while retelling of the story of the Exodus from Egypt and explaining of some of the practices and symbols of the holiday. Tuesday is the deadline for submitting tax returns in the USA, so everyone should have filed their taxes before the day is over. This whole of this coming week is Holy Week. Good Friday and Easter Sunday are significant occasions in the Catholic calendar which commemorate the time of Jesus’ crucifixion, a sacred event for Christians. Sunday will bring families together to eat special meals and just might include ham and hard-boiled eggs. There may even be some chocolate bunnies nestled in baskets for the children to find. 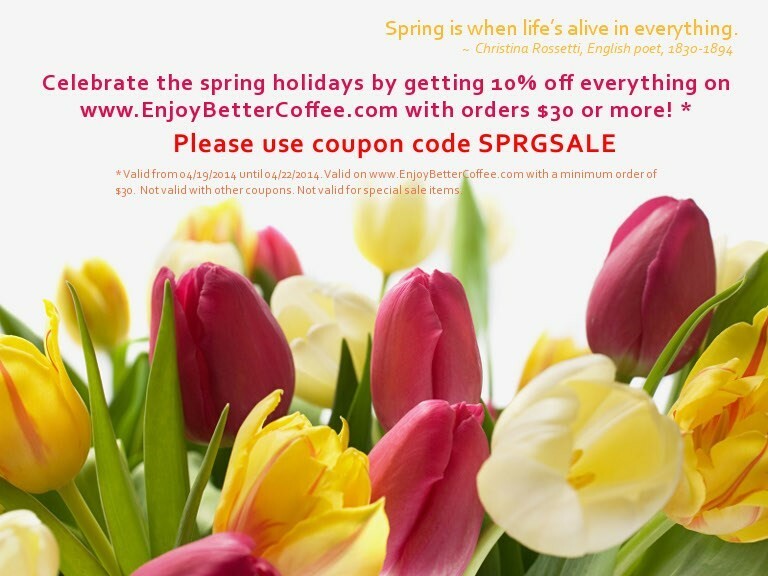 *Discount valid through 4/16/2014 on www.EnjoyBetterCoffee.com with orders of $30 or more. This discount cannot be used with any other coupons or discounts. Not valid for discounted, special sale or case sale items. Deep amidst the Colombian Andes lies the Perija mountain range, one of the remotest coffee-growing regions in the country. This area has been hit hard by political violence starting more than 10 years ago. Displaced small-scale farmers lost everything when they fled their homes and paramilitaries moved in. Now, a permanent army battalion is stationed to give the farmers reassurance to be able to return home and start anew. Because coffee has been such an important source of income for the area, a project is helping more than 600 families in the area to help repair homes, replant fields and boost earnings in specialty coffee production. The project is funded and managed through the country’s Coffee Federation, the Douwe Egberts Foundation and the Dutch Embassy using a budget of almost 4 million Euros ($5.5 million USD). About half of the farmers participating in the project earn a premium for the coffee by meeting UTZ Certified requirements for sustainable farming. Don’t Toss Those Used Coffee Grounds! 1. Deodorize your fridge with a bowl of used coffee grounds set inside. It’ll work just like baking soda to clear odors. 2. 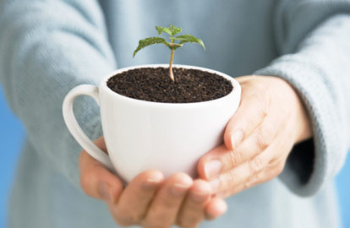 Used coffee grounds help fertilize indoor plants. They are also good for your composting bin. 3. When washing your hair, rub used grounds through the ends, rinse and you will have soft, glossy locks. 4. Used coffee grounds are great for removing cooking smells like garlic from your hands. Just rub a handful and rinse well. 5. Fill a sack or other cloth container with dry used grounds and place in a musty closet or a smelly basement. The University of California, Davis hosted a research conference in the newly-founded Coffee Center last month. 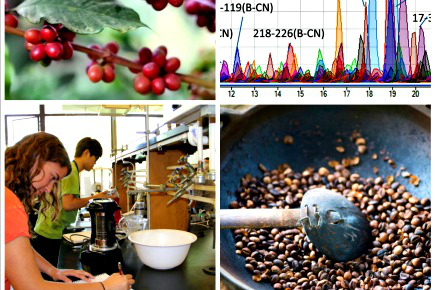 The conference is the first step toward establishing a dedicated coffee research study center, akin to the school’s existing Institute for Wine and Food Science. On the docket were topics such as coffee genetics, sustainable growing and sensory perceptions of coffee drinkers. The Coffee Center will eventually operate a greenhouse to grow coffee for research and study. Ultimately, the school will offer a coffee science major as part of the research programs, but for now, the Coffee Center is looking for a permanent home and early research funding. Carte Noire On Sale is ‘Bon’! Paris. The city of lights. Home to the Eiffel Tower, the Louvre Museum, the cathedral Notre Dame. Berets. Impressionist art. Bridges. Street-side cafes. And coffee. Ah, yes, the coffee! France is the home of history-filled coffee brands such as Carte Noire and Grand Mere. Sipping one of these delicious coffees will bring the Parisian coffee culture right to your cup! Carte Noire, literally “black card”, was born almost 35 years ago by Rene Monnier, a coffee blender and roaster whose family had been producing Grand Mere for more than 10 years before that. The Monniers chose the name and the black and gold packaging to reflect sophistication and elegance. The coffee has long been marketed as “a coffee named desire”, which is also reflected in their commercials and other advertisements. In fact, some might describe their promotion of their coffee as seductive! Carte Noire remains one of France’s most popular coffee brands today. We have it in ground, whole beans, instant and pods. *Discount valid through 4/9/2014 at www.EnjoyBetteroffee.com with no minimum order. Not valid with other coupons. Not valid for special sale items. We’re very excited about all the new products from Douwe Egberts that we have just received from The Netherlands. There is so much to talk about, so let’s jump right in! First, we have some great news about coffee! We again have Aroma Rood Decaf back in stock and ready to ship. This decaf had previously been discontinued, but now it’s back for the foreseeable future. Like all Aroma Rood coffee, this decaf has a strong and robust fragrance. Arabica and Robusta beans are roasted perfectly to create this full-bodied coffee. This is one of the best decaf coffees available today. Order now to ensure you have it on hand when you (or a guest) goes caffeine-free. If you like caffeine in your coffee (and we think that you do! ), check out these new Senseo Intense options. Senseo Espresso Intense pods are filled with strong, flavorful, European roast coffee. Made from 100% Arabica beans roasted slowly, you’ll find notes of caramel and honey. This espresso has a soft and fine crema which is a perfect finish to a meal or and ideal way to start the day. Intensity level 8. Senseo Superior Intense pods have a tangy, spicy dark-roasted flavor with nutty and sweet notes. Full and rich, this coffee is rated at Intensity level 7. Senseo Extreme Intense pods have a spicy flavor with woody, peppery and licorice notes. This coffee is intense and sharp, rated at Intensity level 9. Senseo Black Intense pods are a full and complex blend of long-roasted coffee with chocolate, blackberry and citrus notes. Intensity level 8. We now carry the full line of Aroma Rood products! We have Aroma Rood coffee in ground and whole beans. Try Aroma Rood Blonde in ground. The ground coffee is available in 250g/8.8oz packages and 500g/17.6oz packs. We have Aroma Rood Decaf in ground in 500g/17.6oz packages. We even have Aroma Rood in instantwhich comes in a beautiful, reusable glass jar. The newest jewel in the Aroma Rood crown, though, is Aroma Rood Donker, which is a darker, richer roast. This coffee is full-bodied and spicy in the tradition of true European roast coffee. You can get this coffee in 250g and 500g packs. We now have a Pickwick Black Tea Variation pack of 20 bags, with a selection of Indian Assam tea, Golden China Tea, Earl Grey tea and English Breakfast tea. This is a great collection to have on hand for guests and family, when only traditional tea will do! Get a box for $2.49. *Discount valid through 4/02/2014 on Douwe Egberts coffee and Pickwick teas on orders of $30 or more at www.EnjoyBetterCoffee.com. Not valid for discounted, special sale or case sale Douwe Egberts or Pickwick items.